Lee un artículo que describe los animales de Norte America. Describe animales de tu país o región. There are eight different kinds of bears in the world. Black bears and brown bears live in many areas of North America and polar bears live in parts of Canada and Alaska. Many kinds of bears hibernate, or sleep in the winter. This helps them save energy. In the winter the baby bears, or cubs, are born. The raccoon is a small mammal that looks like it's wearing a mask. It has a striped tail. Raccoons are omnivorous, which means that they can eat many different things. They have very dexterous paws which they can use to open containers to get at the food inside. The beaver is a large rodent with a flat tail that it uses for swimming and for balancing. The beaver is famous for its ability to build dams in rivers and streams. 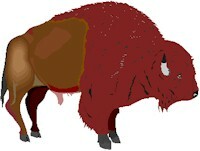 The bison, which is also called the buffalo, has a big head and curved horns. Bison live in herds, or groups of animals, in the western United States and Canada. An adult bison can weigh up to 2000 pounds and a large bison can eat as much as 60 pounds of grass a day! A moose is a member of the deer family. In the spring the male moose grows a set of antlers on its head which he loses in the following winter. Moose can grow to be 7 feet tall and 1500 pounds. Moose are herbivores, which means that they eat plants. Describe un animal (o animales) de tu país o región. Escribe la "Lección Escrita" en la sección para comentarios abajo. Inglés Mundial es una comunidad de personas que quieren aprender inglés gratis. Ayúdense unos a otros y si ven un error en la escritura de otro, respondan con la corrección. Para aprender de errores comunes, sigue la página de Inglés Mundial en Facebook, Google+, o Twitter.